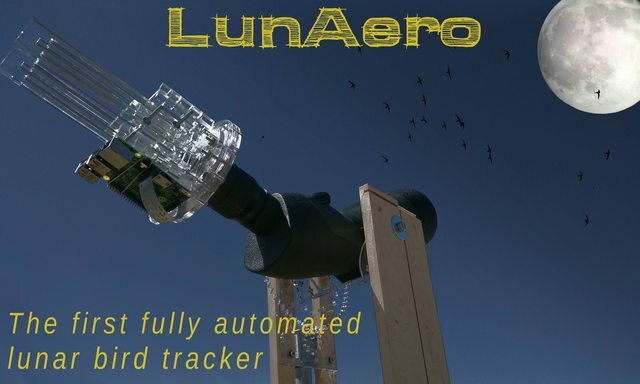 This week, the University of Oklahoma Aeroecology Biologging group started a crowdfunding campaign for LunAero: an automated lunar bird tracking device. 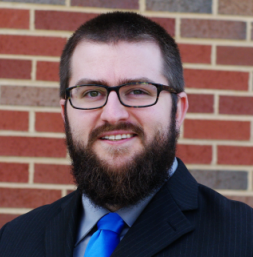 Since this is one of the projects I’m spearheading as part of my postdoctoral position in the lab of Dr. Eli Bridge, I’d like to walk through the current design here. Take a look at the crowdfunding page while you are thinking about it. LunAero is a robot designed to track the moon as it crosses the sky. This isn’t new. Lots of astronomy mounts can be programmed to follow a specific path of a celestial body across the sky. But LunAero doesn’t do it that way. 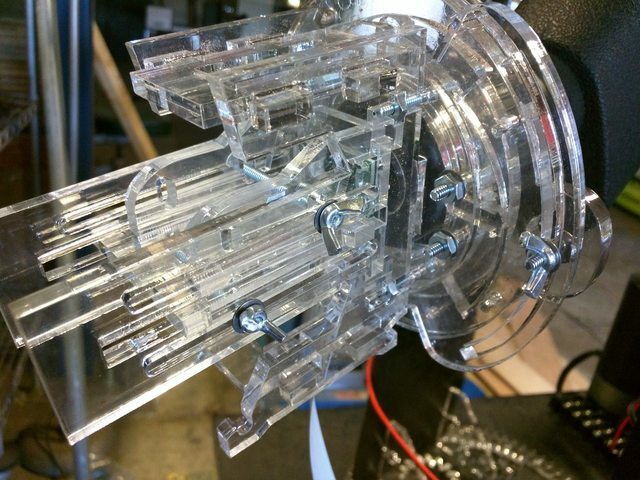 By using a Raspberry Pi as a brain, LunAero tracks the moon by computer vision. This means that it “sees” the moon and tracks it in real time. By using visual tracking, we can compensate for things like wind and excitable dogs in our backyard (true story) knocking the scope off course. We are using OpenCV as a platform for LunAero. If you have ever worked with computer vision, you might say to yourself that this seems like overkill for tracking the moon, a body which follows a very well known and predictable path. There is a reason we do it this way. The end goal of LunAero is not to simply track the moon, but the goal is to identify birds crossing in front of the moon. If you are like me, you may not realize how many birds migrate at night. Since they stop chattering and chirping once the sun sets, it is easy to think they all just sleep. But this is not the case. Birds migrate at night to minimize predation on their massive trek. In a single night, LunAero recorded hundreds of birds crossing the full moon. It was amazing! If you do the math, the moon is a small percentage of the sky. Eventually, the massive scale of night migration will begin to dawn on you. The best method we have for quantifying this event is radar. Our modern weather radars work by detecting water in the air, telling us if that cloud over there is about to rain or not. If you think about it though, all organisms are just bags of water. Don’t think of birds as feathered, flying friends. Instead, think of them like a radar does: as little water balloons. Meteorologists often view our water balloon friends as a source of noise, a nuisance. But a new scientific discipline is emerging called Aeroecology which is very interested in the applications of technologies to study thins living in the air. Using radar isn’t perfect. There is no real baseline for the fast-moving water balloons the radar detects unless you send an ornithologist out to visually count the birds. Doing this at night is a challenge, since light conditions do not favor observation. So we need to use the silhouettes of birds flying in front of the moon to establish a reasonable estimate. Now I don’t know about you, but standing outside with my neck crooked and binoculars plastered to my face instead of sleeping does not sound like a fun time. Thus: LunAero. 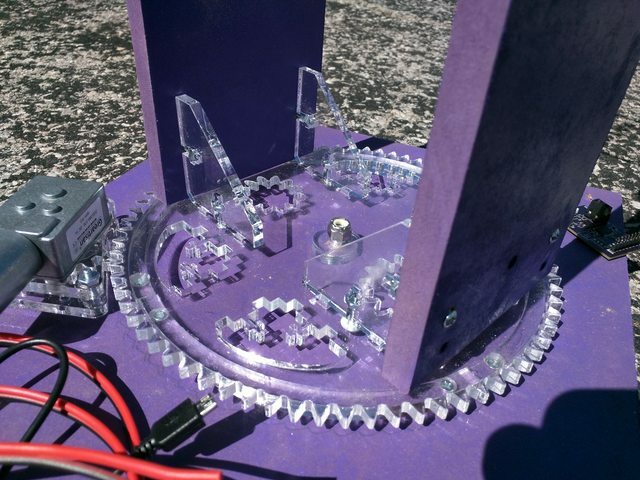 LunAero is controlled by a Raspberry Pi computer. This computer handles the image capture through a dedicated camera and scope adjustment with the GPIO pins. The GPIO pins communicate directions to a TB6612FNG board, which I have discussed in prior posts. 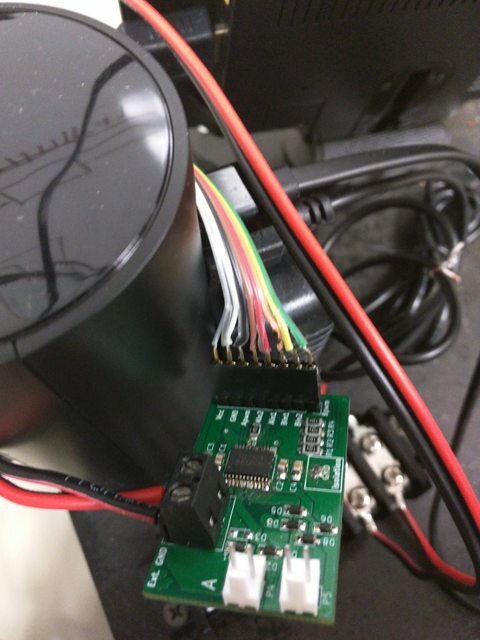 The TB6612FNG provides pulses to 5V gearmotors. The gearmotors supply power to two large gears. The azimuthal axis (the one that spins like a top) rotates the gear that is supporting the rest of the structure. The altitudinal axis (the one that lifts and lowers) is a partial gear that moves a cradle. We don’t need the whole gear, since the moon will rarely pass directly overhead without deviation. The cradle is what holds our spotting scope. 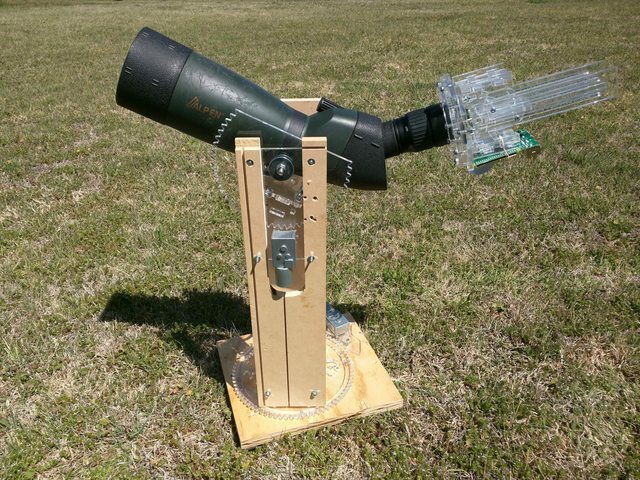 Since LunAero is meant to be employed by bird-nerds, we designed it to accommodate a spotting scope for the optics. It is a reasonable assessment that a serious birder will probably have access to a spotting scope. This is good, because optics are expensive. A ‘low-cost’ spotting scope can be had for $500, while the one I am using at the moment to capture moon footage is ~$3000. The challenge then becomes, how do we attach a standardized camera? 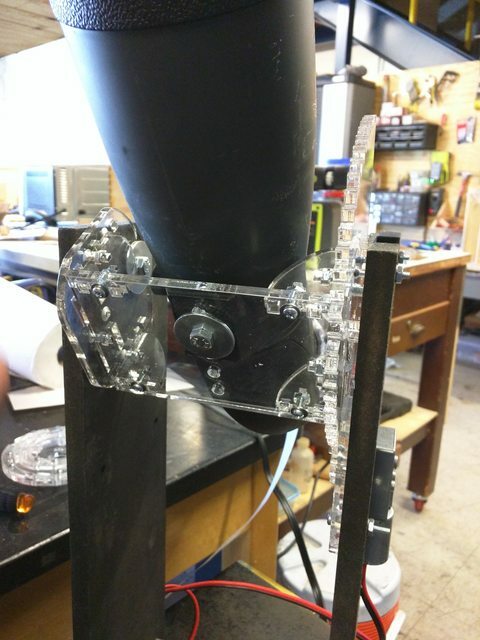 Since all of the eyepieces of scopes are a little different, we had to design a custom adapter for the Raspberry Pi camera which would allow for adjustment in all 3 spatial dimensions. In the end, our adapter looks like a complicated monstrosity, but it works very well. We have a design update planned for it, so I am sure I will discuss more about it later.